Have they published any statistics regarding how many people voted for less than the maximum number allowed? Something that would provide some insight into how many members were “bullet voting” rather than, just voting? The number/percentage of members thus demonstrating some thought in their voting, would be interesting. FWIW, I cast a single vote, because a friend asked me to, and I couldn’t detect a reason not to vote for the candidate. Other than “valid ballots,” nothing else is documented about non-error ballots. I make it a point to pull the ballot from the magazine and vote the night I get it. In the past few years, I’ve made it a point to vote for people I’ve done some research on and as a consequence, I haven’t cast a vote for the maximum allowed for the past little while. You can have my “I Voted” button from this year’s AM if you get me a mailing address. Aw, thank you! I’ll see if one of my board friends can track one down for me while I’m still here, but if not, I may email you if you’re not planning to keep it. I do love those little things that promote member involvement. I may have related this before, but, I have heard of voting systems where, when there are multiple candidates (e.g., 25) the voters vote against as many candidates as they don’t want, and the winners are the candidates who get the fewest votes cast against them. I could see many advantages to that, but it would probably be a concept hard for many people to absorb. Do you have a link to the complete results? They aren’t typically posted, but I can try to get it up shortly. I’m intensely curious to see how the younger crowd of candidates did, both in the general election and in the voting for the 76th seat. We want to hit the floor one last time and then I’ll post the full list and results later. After 5 years as an annual member and now a fully paid Life Member I got a ballot in the 1st Freedom magazine. I did not vote for all the 26 allowed, but I did vote for Tom Selleck, R. Lee Ermey and Kim Rhode Harryman. Those I remember. Not voting is a choice, it means you are ok with the status quo, and/or candidates offering change are only offerimg marginal change. The direction of the NRA seems ok so far, if only at a snail’s pace compared to social media. Dana Loesch is a good, visible surrogate on MSM, we need more. I’d like to see the old guard like WLP amd Chris Cox retire on a high note of success amd hand the keys to a younger generation. I thought that they should have done this three years ago, but I concede I was wrong about that. Endorsememt of Trump was a bold risky move that paid off bigly huge. For all the criticism of WLP and leadership, which seems to lack diversity, we are winning the public debate. We do still need to make significant inroads into crime ridden bankrupt urban areas. The curremt model in cities like Baltimore is unsustainable. Chris is young for the gun movement. Who exactly do you see taking over who is both significantly younger to be considered a new generation and actually qualified with solid experience? I listened to Trump’s speech at the convention, and other than citing the reversal of Obama’s no-lead-ammo-on-federal-land EO, I did not hear him address a single gun-related issue. In fact, I thought it seemed he had not even respected us enough to be bothered preparing a speech; it seemed mostly a reprise of his familiar “wasn’t the night of November 8 wonderful/they said it couldn’t be done” self-congratulation. Demonstrating some knowledge of exactly what issues constituted our “eight year nightmare under Obama” would have been nice, too. I don’t know if they still have applause-o-meters like they once had for Ted Mack’s Original Amateur Hour, but if it could be quantified, it seemed to me he got the biggest cheers for The Wall. At least gun owners are telling him what is most important to them, and some might be led to think it’s not guns. I’m going to be nice and just respond to your criticism, Whetherman, that most NRA members and voters consider things like SCOTUS appointments to be much, much more valuable to the cause than speeches that pander to what we specifically want to hear. I would love for more politicians to talk gun issues at NRA, but Trump wasn’t endorsed for his ability to give a speech that makes you feel good. Trump was endorsed because the alternative was Hillary Clinton filling the Supreme Court with her nominees. I’ll be nice too, and merely point out that we are only hoping that the other SCOTUS appointments Trump will be directed to make, happen to value gun rights as part of their overall ideological package; and realistically, Gorsuch has yet to prove himself in any substantial way. And allow me to also confess I have no faith at all that gun rights will be a key issue for the people who will tell Trump who to appoint — or even give him a wish list. Please remember that Robert Bork, who is pretty much the poster-child for “conservatives” failing to get their SCOTUS wishes, had opined that the Second Amendment was a collective and not an individual right, and that the NRA was excoriated by many conservatives for not being a “team player” and putting its own interests aside to support the issues conservatives really cared about. But the point of the story is, “conservatism” alone guaranteed nothing with regard to gun rights. “I’m not an expert on the Second Amendment,” Judge Robert Bork said in 1989, “but its intent was to guarantee the right of states to form militia, not for individuals to bear arms.” In 1991, Bork noted the weak support the gun lobby has in the Second Amendment. What I specifically want to hear out of a pol is that he/she has some specific interest in and knowledge of our issues, and maybe some priorities for which of those they plan to do something about. For years now gun owners have been giving their hearts away to anyone who could master the three words “enforce existing laws,” without ever challenging whether the hacks mouthing the words even had any idea what those existing laws were. Don’t get me wrong, I see value in younger views of the world and want those represented, but I also see value in actual documented experience with people and achievements that prove someone is competent even if youthful. And youth for the sake of youth attitudes seem to overlook that. I see the argument on Wayne, and I think there are valid points to a discussion of when he might be ready to retire on a high note. But the argument that Chris is old and needs to step down to a new generation still blows my mind. Do you realize that a solid generation younger would be a college kid? I think around a sophomore. Is there a college sophomore or other 20 year old who has a record of legislative experience at the state and federal level to run ILA? I was super involved in Second Amendment activism at 20, and not even I knew anyone with any real experience on that front. We could typically get in front of reporters a little easier, but that doesn’t mean we were remotely qualified to be professional lobbyists. Even if you mean generation from a symbolic standpoint, that’s a bit more confusing. Chris is an Xer. I’m typically considered the first year of Millennial. We’re about 10 years apart. Is there a Millennial out there who has the record of experience needed to run a division such as ILA? I’m very open to really learning about someone with that kind of experience and skill set because I’d love to see more in the movement. Actually, Chris is a great example of someone who achieved a lot of success on this front at a very young age compared to others in the field (of lobbying in general, not just gun rights lobbying). Now if you do have real suggestions, and I hope you do, then great and I hope we learn more about this new talent. But I fear that what I’ve seen on social media about the obsession with “younger people” is really focused on supporting youthful looking folks who happen to have some success getting popular online. 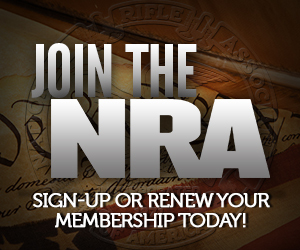 But as we saw with some Board elections, much of the NRA member base is engaged with the issue offline. That doesn’t mean they are technophobes, but it means they are spending less time on gun forums or blogs than at Friends of NRA events or at their local shooting club hanging out with friends they have made there. Online presence and awareness matters, but it’s not the same as being engaged in your community around you. And that last part is particularly important for someone who wants to manage a lobby/political activism division of NRA, as well as someone higher up the chain running an entire grassroots organization. Of course, actually GETTING ballots would help. I know of a significant number of folks who didn’t get ballots in Feb and had to contact the NRA to get a ballot. Happened to me and at least 5 others at my gun club and 3 others that I know of outside of my area. That is 6 out of about a hundred at the gun club so it probably isn’t just a statistical clustering…..
FWIW I didn’t get mine until well into March, and had been wondering what was up, because it seemed everyone else was talking about the ballot. We called and were told that they had been in the Feb magazines. But they weren’t. We did get replacements, but barely in time to respond. In the (counting in my head how long it’s been since I was in college…) 11 years that I’ve been a voting member, this has only happened to me one time. And yes, it did seem to happen to more people I knew that year. But, as you said, they do fix it. (If sometimes a bit too close to the deadline for ideal voting circumstances.) It’s never happened again, so I don’t think this is a major, major issue. The main thing is that voters should be informed that they can call and get their ballots taken care of. Now, I would like to see them notify electronic magazine subscribers by email when their ballots were mailed so we know when to look for them. They come much later than the magazine issues, and I think there’s room for confusion there among NRA members. It’s not just SCOTUS appointments. There are 127 Federal Judge positions open, and the possibility of splitting the 9th Circuit into something more manageable is a possibility. The District and Appellate positions are almost as important as the SCOTUS, IMO. I’ve been a member for 4 years and I’m not yet allowed to vote. I wonder how many sub 5 year members would vote if given the chance. The 5 year limit is to keep the ANTi GUN folks from stacking the ballot with votes for weaker candidates. I was happy to wait my 5 years because it shows dedication to the organization and gave me time to really understand the scope of the organization. (Granted, I was already on EPL by the time I hit 5 years, so I would have been eligible soon.) Plus, as B notes below, it does keep anti-gunners from buying a one year membership and impacting the Board for 3 years. However, you can look to voting in person at Annual Meeting as one gauge since nearly every single NRA member can vote in that election for 76th director. 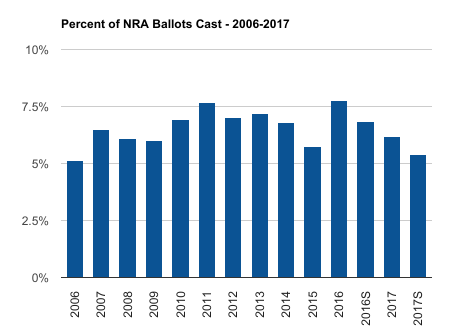 While I don’t have access to exactly how many qualified voters (those who joined before March 10, 2017, IIRC the date correctly) were in attendance at NRAAM, I suspect that it was many, many, many times more than the 2,007 who actually cast ballots. And this was a year of higher turnout in that election since multiple people were campaigning onsite and online.